Pinterest is the number one source of social media traffic to Massachusetts Real Estate Exposure, my combination blog/real estate site. One of the reasons for this is the “shelf life” of the pins you share. Pinterest sharing is an endless cycle that continues to generate more traffic when the content is exceptional. 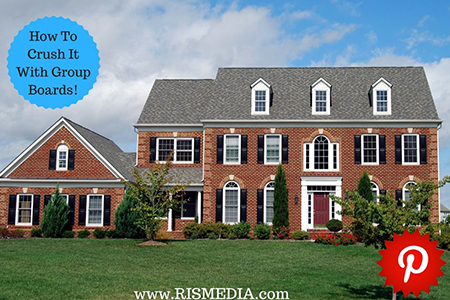 Outstanding real estate content on Pinterest can be shared for months and months even years. Like any other social network, make sure what you are sharing is quality content. Don’t just share real estate content. Make sure your boards are well rounded with other appealing content. In fact, you can check out my Pinterest profile to see how my boards are constructed. Apply for “Rich Pins”. This adds html mark-up to your pins that make them stand out from others. Pinterest Real Estate Group Board– This is one of the largest real estate boards found on Pinterest with just under 12,000 followers and 300 members. This board encompasses a variety of real estate topics from general sales advice, financing, staging, home improvement, marketing, technology and social media. Invited members are highly influential in the real estate industry and often are seen in other social networks. There are some strict rules including not being allowed to pin listings, market reports, news or local information. There are over 7,100 pins! Real Estate/Home Improvement/Realtor® Advice– This board is similar to the above mentioned board and has many of the same rules that need to be followed. There are currently 8,300 followers and 102 members. There are 2,400+ pins. Real Estate/Mortgage/Social Media– This is an up-and-coming board that is just starting to grow in size and stature. There are just under 7,000 followers with only 15 active posting members. Let’s get this one growing people! There are 700+ pins. Buying a home and mortgage advice– This is another excellent group board not only for real estate agents, but mortgage professionals as well. Much of the content focuses on home buying along with finance and mortgage topics. The board is quite large with just under 16,000 followers and 140 members. There are 1,600 pins. Using Pinterest For Real Estate via Placester. How to master Pinterest as a real estate agent via RESAAS Blog. Using Pinterest for social media exposure via Massachusetts Real Estate News. Bill Gassett is a nationally recognized real estate leader who has been helping people move in and out of the Metrowest Massachusetts area for the past 29+years. He has been one of the top RE/MAX REALTORS® in New England for the past decade. In 2015, he was the number 5 RE/MAX agent in Massachusetts. Connect with him on Google+.